The Guest House is a perfect escape for couples looking to unwind and spend time together. 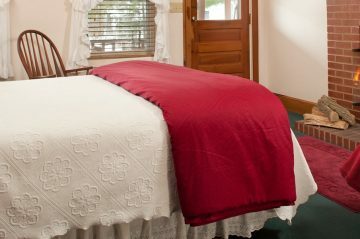 Experience true Amish Country with our lodging inspired by the magic and uniqueness of the area. At The White Oak Inn, we’re committed to making our guests feel at home, which means offering a special place for their pets. We are a pet-friendly hotel in Ohio’s Amish Country, with two rooms located in our Guest House that are designed for guests with animals in tow. 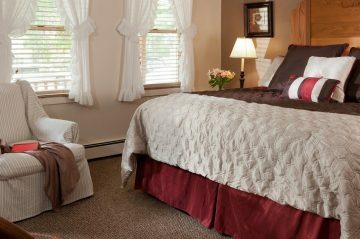 Our Guest House rooms are cozy and well-appointed. If snuggling in bed by firelight while listening to a gentle rain tapping on a tin roof sounds romantic to you, then you’ll love our Guest House rooms, located just a short stroll across the parking lot. The Willow has a queen-size bed and electric fireplace, and The Redbud and Dogwood have king-size beds and wood-burning fireplaces. Each room has air conditioning, TV/DVD players with DIRECTV, and full private bathroom. Enjoy the privacy and relaxation of a romantic getaway in our Guest Rooms. 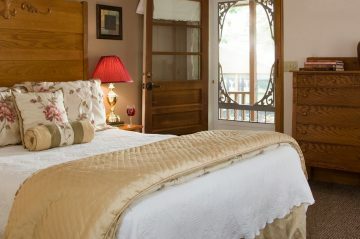 Pets are welcome in two of the Guest House rooms, The Willow and Dogwood Rooms. Dougal, our inn dog, and Rascal, our inn cat, are cherished members of The White Oak Inn family. As such, we’re proud to be a pet friendly hotel located in Amish Country Ohio. We have long welcomed animals into our inn, housing cats, dogs, and even sheep over the years, so we are delighted to do the same for our guests.